Most Wood River Valley folks think of Ketchum resident Rebecca Rusch in a kind of awe-inspiring, slightly envious way. After all, the “Queen of Pain” has not only set records in endurance races and mountain biking treks, but serves as a Ketchum firefighter and hosts annual charitable bike race Rebecca’s Private Idaho. Now the mountain biking, whitewater rafting and skiing expert and all-around adventurer has published a nearly 300-page account of her life and times. It came out this month. 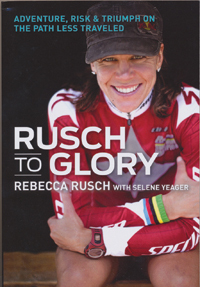 Rusch had help from Selene Yeager, a fellow athlete who is in the book industry, but, she said, “the words are all mine,” she said. Publisher VeloPress approached Rusch to write the memoir and Yeager told her to go for it. Having blogged for years, Rusch said the push from VeloPress gave her the confidence to get writing. With titles like 2010 world master’s champion for cross-country mountain biking, 2011 national cross-country single-speed champion and the female record holder for the 142-mile Kokopelli Trail in 2013, Rusch wants the world to know that being a champion doesn’t come without years of hard work. Rusch’s athletic accomplishments are discussed in the book, but perhaps less so than readers would expect. “People feel like they know me in this town, [but] I don’t talk about biking or climbing until halfway through the book,” she said. Rusch talks about athleticism with humility—she says in the introduction that divine destiny and a predetermined “winning hand” are not what make an athlete. “While you might look at my life now and think I’m just another pro who was groomed for glory, once you know the whole story, you’ll realize that we have more in common than you might think,” she wrote. The book consumed the past nine months of her life, Rusch said, but now she’s on to the next great adventure: biking the entire Ho Chi Minh Trail in Vietnam—some 800 miles, either this January or next. Red Bull will sponsor her trip and produce a documentary. It’s both a personal and a recreational opportunity: Rusch’s father was a Vietnam soldier who died in a plane crash near the trail. “I hope it launches more adventures, opens doors to be able to do more things,” Rusch said. Her book can be found at Ketchum bookstores as well as online. Rusch will give a reading at The Community Library on Wednesday, Nov. 19, at 6 p.m.
“I would love for people to come and share their stories,” she said.